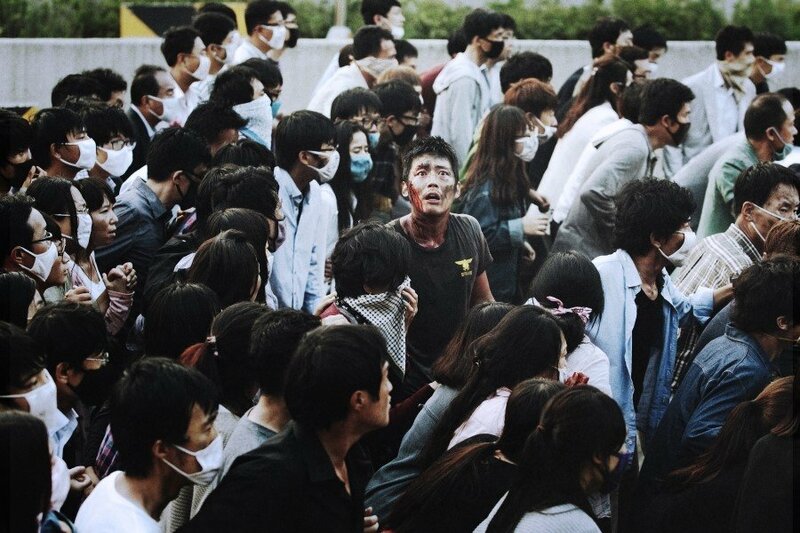 It was only last summer that Korea released its first film featuring a deadly disease when Deranged became a big hit in June. Coming from the same studio (CJ Entertainment), the new epidemic thriller The Flu, the first work from director Kim Sung-su (Beat, 1997) in 10 years, seeks to strike gold again with the same blend of star power, family dynamics and chaos. 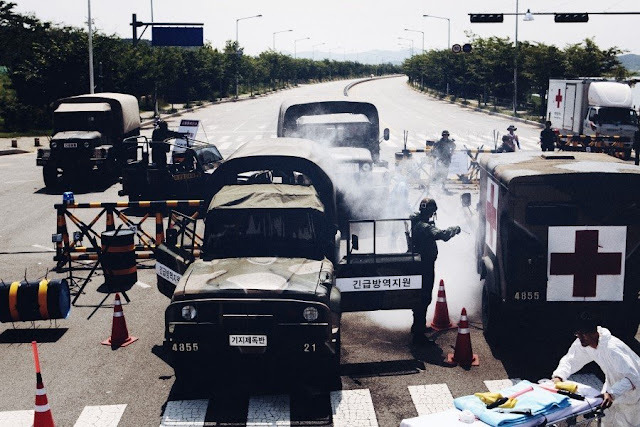 A ship container full of illegal immigrants is delivered to Korea and when it is opened in Bundang, one of Seoul's affluent new satellite cities, its passengers are found dead, save for one very sick man. Meanwhile, a fireman (Jang Hyeok) takes a shine to a single mother (Soo-ae) he saves from an accident. Just as he is getting to know the woman, who is a doctor, and her cute daughter, a deadly contagion grips their town. Disaster films have become prominent in Korean cinema since the incredible success of Haeundae, the tsunami film that sailed over ten million admissions in the summer of 2009. Recent examples include last winter's The Tower and one could even trace the trend back to Bong Joon-ho's 2006 creature feature The Host (at just over 13 million admissions, still top dog on the all time Korean box office chart). 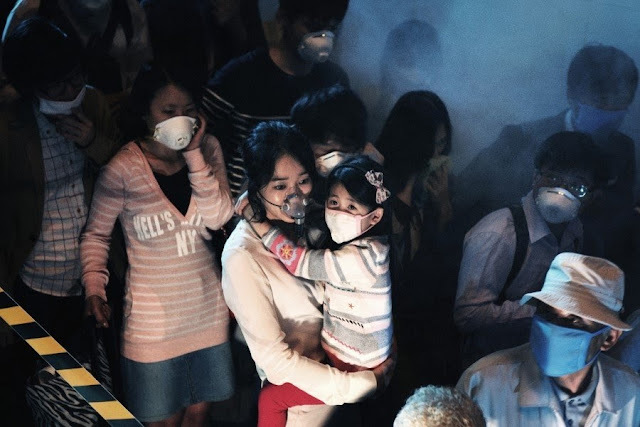 With ever-rising production values, the Korean film industry has no trouble handling the technical demands of these films, but what sets them apart from other disaster films is the prominence of other genre tropes, particularly melodrama. The Flu gets up and running fast as its premise and major characters are quickly introduced and positioned for their eventual roles in the catastrophe to follow. Breathless editing, concise (if simplistic) plotting and clear lensing are strong assets during the set-up act and when events in the narrative take a darker turn, an appropriate sense of dread and panic takes hold. However, despite its trim staging, there is a larger-than-usual focus on the mother and daughter, not to mention the surrogate father figure of the fireman. By the halfway point, this becomes the focal point of the film despite the presence of myriad characters, such as doctors, corrupt police, politicians, military and foreign disease experts, each more superfluous than the last as they fill necessary but poorly drawn stock roles, or, worse still, are used as thread to stitch some of the narrative folds together, lacking reasonable motivations. For a film about a highly contagious disease that kills within 36 hours, the narrative spends an awfully long time ignoring the surrounding horrors as it focuses instead on family. Melodrama is a very popular device in commercial Korean cinema that has proven popular with local audiences, thus its prominence here is not surprising. Deranged did the same thing last year but it performed a better balancing act between its thriller elements and melodramatic instincts, though in truth, I was not a fan of that film, either. In The Flu, the pandemic doesn't feel like the main event, despite the large scale of the proceedings which suggest that it should be. The film effortlessly stages a massive epidemic with the help of impressive sets, a large number of extras and some terrific editing. However, as with some other big Korean productions, more becomes less as the escalating havoc eventually becomes cartoonish in its excess, robbing the film of its urgency. As the dashing and (somewhat) heroic fireman, Jang Hyeok is a good fit, if not altogether memorable. Soo-ae, who plays the mother, does a decent job of juggling the various facets of her character: serious as a doctor, while both compassionate and selfish as a mother. However, and this has often been a problem for me with her work, she comes off as rather unlikeable. The supporting cast features some stellar bit players such as Yu Ji-tae and Ma Dong-seok; sadly, they are wasted on caricatured roles. Kim Sung-su was a big name in Korean cinema around the turn of the millennium, having signed two stellar gangster films starring Jung Woo-sung, Beat and City of the Rising Sun (1998). Following 2003's Please Teach Me English he wasn't able to get a project completed, despite many false starts. As a comeback film, The Flu demonstrates his keen feel for cinema in its early stages, but when it begins to implode it is no longer Kim's presence that is felt behind the camera. Like many other commercial films coming out of Korea of late, the ending falters badly under the weight of excessive melodramatic posturing. Following a solid first hour, Kim's film begins to unravel as the plot becomes riddled with contrivances and populated with superfluous characters, eventually succumbing to a big melodramatic finish. Though the poor form shown in the back half is likely exacerbated by the film's strong start, it's rarely first impressions that mark you when you leave the theater. Disclaimer: I watched The Flu at a press screening in Seoul without subtitles. While my Korean is not yet strong enough to have caught everything, I understood the vast majority of the film.